Spacious and stylish, the Gainsborough left-hand corner sofa will bring warmth and comfort to your living room layout. 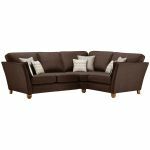 With plenty of seating, it’s great for entertaining guests and perfect for those days when you simply need to stretch out and relax. 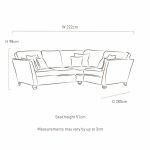 Complete with no-plump, foam-filled cushions and solid hardwood used in the frame, you can rely on it to provide lasting quality over the years. Designed with elegant, gently flared arms and beautiful turned solid oak feet, it has a timeless finish that will look effortlessly stylish in any home. Pair the Gainsborough left-hand corner sofa with a matching footstool from the range to finish off the look.